What is a Custom Metadata Type? Why should one use it? How should one use it? And, last but not least, how is Custom Metadata Type related to, or different than, Custom Object? Well, let us explore these concepts together! Custom Metadata Type is similar to a custom object – it allows application developers to create custom sets of data, as well as to create and associate custom data with an organization. All custom metadata type data is available in the application cache. As a result, it allows efficient access to the data without the cost of repeated queries (SOQL) to a database. Custom Metadata Type is mainly used to store information that will be frequently accessed from Apex code. Custom Metadata Type performs better than a custom object because it is available in cache; and therefore, it does not have to be queried. The other difference, which you will notice between the custom metadata type and a custom object, is the difference in the suffix. Custom Metadata type has __mdt suffix at the end of the custom metadata type, as opposed to the usual __c for custom objects. As of the Summer’17 release, custom metadata is not yet available in Process Builder. However, it is currently available in Visual Workflow. Let us start with a business use case. Pamela Kline is working as System administrator at Universal Containers. 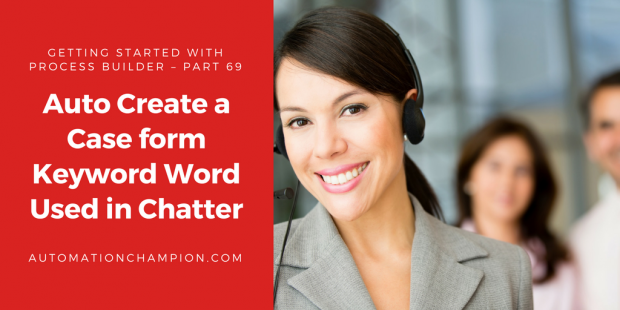 At UC they are using Chatter extensively for internal communication to manage Sales and Support. Business Users are often using Chatter to ask help from Internal Salesforce team regarding how to use some feature. Pamela has received a requirement to auto-create a case whenever a new Chatter post (not a comment) contains a keyword word. She received a list of keyword words (almost 11 words) from her manager. Pamela’s task is to ensure that only a single case is created even if Chatter posts contain numerous keyword words. Create an Apex Trigger on the FeedItem object – We will work on this option in our upcoming Apex Series. Use all 11 keywords in a Process Builder (On feedItem object) entry criteria and use the Create a Record action to auto-create a case. The problem with this approach, however, is that if, after few days, the business wants to add or remove a few keywords, then you have to start from scratch again. Use Custom Setting to store the keywords and then use Process Builder to manage your logic. Use Custom Metadata Type to store the keywords and then use Visual Workflow and Process Builder to manage your logic. Custom metadata provides the flexibility to add or remove keywords without having to change your Process definition or Flow. Once you are done, click on the Save button. Read the rest of this entry! Whether you’re lucky enough to boast a wealth of experience, skills, or winning charm, job interviews are a daunting experience for everyone. The interview process is all about being able to effectively translate your best assets to your interviewer, whilst best understanding what they want from their next hire. Mason Frank International’s specialist Salesforce recruiters have contributed their best tips to consider when interviewing for three key Salesforce positions – admin, sales, and developer. Salesforce administrators need to be able to demonstrate their ‘bedside manners’. As an admin, you’re primarily a communicator. You need to make sure you can effectively demonstrate your capacity to discuss Salesforce features. You’re the number one touchpoint for users across the organization meaning you must showcase your soft skills and likeability, as well as knowledge of your particular experiences with the platform. Admins must have knowledge and enthusiasm for the product. Demonstrate your familiarity, but also highlight the areas which you’d like to learn more about. This shows keenness for development which is something organizations love to see. A Salesforce sales representative must prove their knowledge of the product. In the interview, you’re likely to be asked to prove quota attainment and you should be specific with the numbers you quote. What were your previous targets and what did you comparatively achieve?